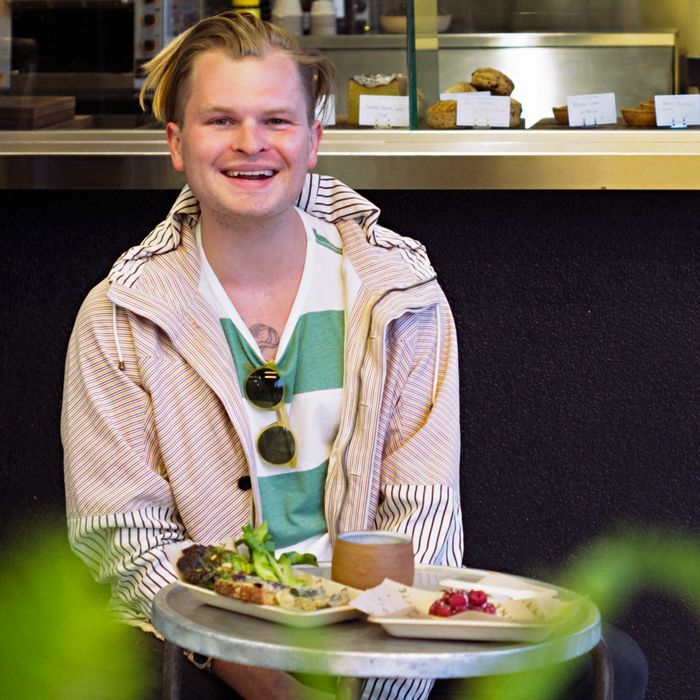 Taylor at Dinette, near his home in Los Angeles. This morning, my girlfriend made an amazing sort of Danish-inspired smørrebrød, but with avocado — which, of course, is not a native fruit of Denmark, but here in L.A. avocados outnumber people who walk to their local grocery store. It was on the classic dense and seedy Danish brown bread, with a little crème fraîche; shungiku (edible chrysanthemum leaf), cilantro, and dill (all of which are greens growing in our garden out back); and lemon juice from the lemons from the tree in the front. I know: L.A. in April is pretty chill … this is a total humble-brag, but it’s fun and novel for someone who’s lived in New York for the last 14 years. She threw in some Thai bird chilies for good measure and topped it with a soft-boiled egg and flaky sea salt. Plus, an iced mate tea to jump-start the morning. Wow. This was an incredible breakfast. My friend John Kirby and I left the studio for a lunch break at Sqirl. This place is on it. I love to go here because they make food in a style and approach that I might want to make at home — it’s perfect for when I don’t wanna cook. This place is always delicious, and their menu changes all the time, which makes it easy to go more times a week than one should. Today, I had braised black-eyed peas with collard greens, a poached egg, aioli, mustard greens, and celery. So, so, so good. Also, Sqirl cold-brews its iced tea, then serves it without ice. I wish more places that served iced tea thought to do it this way, because, honestly, it’s the only way it should really be done. No need for extra ice — just serve it cold. It’s a simple thing, but I love it. Kirby and I headed back to the studio after lunch and worked until about 10 p.m., which means dinner just didn’t happen. A friend and musician I work with named Kirin J Callinan was in town from Australia to play some shows, and he crashed at my place last night. I took this as an opportunity to make him some breakfast, as he always loves to eat at my house. And I love feeding the guy. I made an omelette with leeks wilted in bacon fat, tarragon, and goat cheese. Lately, this is my favorite omelette to make. I served it with some olive-oiled grilled toast and coffee. I had to go to Venice for a meeting, so I went to one of my favorite places to eat lunch on Venice Beach called Poke-Poke. I don’t know exactly how to pronounce the name of this place. I just Googled it and all I came up with are Pokémon references. Anyways, it’s amazing. It’s served in a bowl, to-go style. The line is usually a little long, as everyone in the area knows how much of a gem it is. I had a raw ahi tuna bowl, with avocado, seaweed, jalapeño, pickled ginger, cilantro, masago, shoyu, and sesame oil. Honestly, it’s a perfect lunch for me on any day of my life. For dinner, my friends and I shared a plate of cheese and charcuterie at a French restaurant in Echo Park called Taix. Apparently, it was voted best French restaurant in L.A. by someone in 2012. Somehow I don’t feel like that poll was sampling every French eatery in L.A., but I love this place nonetheless … Mostly it’s just a good place to grab a drink with friends, as the atmosphere feels just like the restaurant someone’s parents went on a dinner date to during the ‘80s. No white tablecloths, but a general “fancy feel” to the place, with wood-paneled walls and well-mannered hostesses to great you upon entry. The cheese plate was actually not too bad. And the people there are really friendly and chill — not uptight at all, as one might expect at 2012’s best French Restaurant in L.A. This is most likely my favorite place so far to grab a drink in Echo Park. Chego and Pok Pok. Both are located in the same outdoor-shopping-mall situation called Far East Plaza. There’s a great food court area, where you can grab dishes from different places and sit down at big picnic tables in the common area. This might all sound like the crappy mall food courts that I grew up with in Seattle as a kid, but I promise, there is great eating here. My girlfriend and I shared the pad see ew (pretty straight-up, but done well, nonetheless) from Pok Pok, and the Leafy T from Chego — which is a garlic-tofu rice, with basil, water spinach, and Chinese broccoli. Both were great. And iced tea from Ten Ren (also located in the same plaza), which is an international tea-store chain that is actually totally solid when you need Taiwanese or Chinese teas. I’ve been going to the one in New York’s Chinatown for years. As for Easter dinner, it didn’t end up happening. After a pretty filling lunch, I headed into the studio for the rest of the afternoon, until late. This happens sometimes, but only in busy times — which is now. I had an early breakfast at Dinette. This place is great and within walking distance from my house. It has the same owner as a fantastic local spot for drinks, Cafe Stella in Silver Lake. I had a pumpernickel toast with smoked lox, cream cheese, and chives, and it was seasoned with everything-bagel seasoning. I loved it so much that it made me miss New York. Lunch got skipped, as I was working in the studio. For dinner, I cooked some simple food: roasted fingerling potatoes and a soft-boiled egg, some wilted bitter dandelion greens from our garden out back, and char-grilled spring onion. This meal ticks all the boxes and takes very little effort to prepare. I can be exhausted from a long day of work, but I usually always have it in me to pull this one off. It’s also one of my favorite meals to make for myself and for friends. Breakfast was a quick miso soup that I like to make. I keep dashi that I make earlier in the week just for this meal, which I have pretty regularly. I warm the dashi broth up to almost a boil (but never boil), then remove it from the heat. I add miso paste to a bowl with sesame seeds, a few drops of (preferably good) sesame oil, a bit of shoyu, and some togarashi seasoning. Then I stir in the broth with the miso and other ingredients to make a soup, add cilantro and basil at the end, usually a little more sea salt to taste, and some Thai bird chilies. To round it out I drop a soft-boiled egg inside at the last minute before serving so it doesn’t overcook. I made music today with my bandmate Ed [Droste], so lunch was on-the-go again today. We like this place called Forage, which is a very fresh place to grab a healthy lunch à la carte. I had three side orders, which is always my favorite option here: spring vegetables with cilantro and basil with a red-wine caraway vinaigrette; market lettuces with fava beans, shallots, and herbs; and coconut basmati rice with snap peas, cashews, basil, and mint. So fresh, so good. Dinner was at Night Market + Song in Silver Lake. This place is pretty much one of my favorites here in L.A. I have yet to order something here that isn’t incredible. The food is always disarmingly delicious, and sometimes disarmingly spicy. It’s safe to say that, since moving here, it has become one of my favorite local dining spots. It also has an incredible natural-wine list, which is not only fairly rare here in L.A., but perfectly fits with the food. We shared chicken tom kha gai, which was definitely the best I’ve ever had and spicy as hell. It was served with a side of coconut rice. One dish that is particularly crave-able is the crispy rice with pork, ginger, onion, peanuts, and cilantro. I get this dish pretty much every time I visit. And, lastly, a classic raw-papaya salad with dried shrimp, cilantro, carrot, and chilies. Although I was fairly warned by the staff that all three dishes were spicy, I ordered them anyway. I think it was the spiciest meal I’ve ever had. And I loved it.